How about if I tell you I know the ideal gift to treat your dad or the man in your life for Father’s Day? Unlike another necktie or shirt that will eventually end up in the back of his closet or purposely lost, perhaps, tucked away in the sock drawer, I have a better idea. Show him some true love with a delicious and nutritious assortment of Balance Bars like sweet and salty BARE bars that will recharge his energy like the ones I reviewed for this Balance Bar Father’s Day Gift Set. These BARE bars have some crunch with nuts atop a sweet coated bottom of pure delight like Sweet & Salty Peanut Butter, Blueberry Acai, and the Sweet & Salty Chocolate Almond. You would think that the two tastes would interfere with each other, however, they are perfect compliments. Even though I am quite taken with Balance Bar Double Chocolate Brownie since it is scrumptious like a candy bar only better for you with vitamins, minerals, and protein to keep you going, I am now also hooked on this Sweet & Salty Chocolate Almond, my favorite of this trio. If you think these are just other nutrition/energy bars, then you would be sorely mistaken. Each BARE Balance bar is only 200 calories, but provides a whooping 15 grams of protein, up to 5 grams of fibers and 7 grams of whole grains along with 19 vitamins and minerals in a natural organic agave and brown rice syrup that will help stabilize blood sugar levels as well satisfying hunger when in a rush. I really do eat and recommend Balance Bars because they do help satisfy your sweet tooth and keep you full with plenty of healthy nourishment. Think what a big smile that special man would get if you gave him something he will actually love instead of pretending. He can pack these bars in his briefcase to keep just in case he needs a quick lift–and with every tasty bite he will think of thoughtful you. So solve your Father’s Day gift buying problems with this limited-edition Balance Bar Father’s Day Gift Set, which includes 15 BARE Balance bars in Sweet & Salty Peanut Butter, Sweet & Salty Chocolate Almond, and Blueberry Acai. In addition, the gift set comes with a water bottle with a special built-in compartment to store a BARE bar and a playful “BARE Hug” Father’s Day card. Place your order before June 11, 2012 and get free ground shipping within the USA with a price of $17.84. 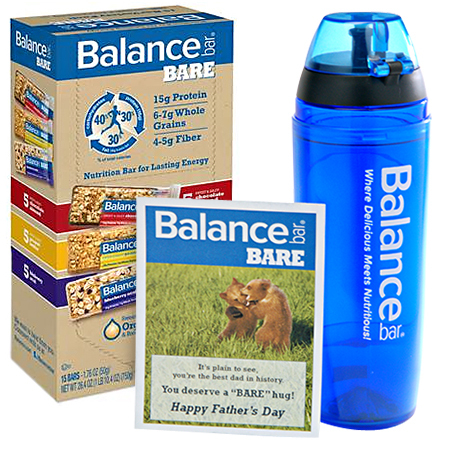 Thanks to Balance Bar, one lucky Nuts 4 Stuff reader in the continental United States can win this limited-edition Balance Bar Father’s Day Gift Set of 15 BARE Balance bars in Sweet & Salty Peanut Butter, Sweet & Salty Chocolate Almond, and Blueberry Acai, the water bottle with a special built-in compartment to store a BARE bar and a playful “BARE Hug” Father’s Day card ($27.00 value). 1. You must follow me on Google Friends Connect before any of your entries will count. If you already follow, INCLUDE your *EMAIL* with the NAME you follow me by in a comment. 2. Go to Balance Bar and tell me what other bar you would love to try first or something else you learned from their website in another comment. Leave a separate comment for each entry. Be sure you include your email address inside your comment so I can contact you if you win. This giveaway is only open to residents of the United States. No PO Boxes just USA-based street addresses. ***Any entries that contain a link or website address for redirecting readers to your site to sell your products will be deleted when found. I am giving you a chance to win, not advertise for free. *** Do follow the rules because I check entries. Be alert that if you attempt to enter using multiple identities will be grounds for disqualification. This giveaway ends June 1, 2012 at 12 PM Eastern Standard Time. The winner will need to respond to my email with name and shipping address within 48-hours or another winner will be picked. I would like to try the cinnamon roll cafe bar flavor. I'd like to try the Balance Bar Original. I entered the elizabethW Leaves and Magnolia Perfumes & Body Cream Sets Giveaway. I entered the Beauty Forte Mineral Sunscreen and Mineral Whitening Giveaway. I am a GFC follower. sweepmom. sweepmom at comcast dot net. I would like to try the Chocolate Mint Cookie Crunch Balance Bar. I liked Nuts 4 stuff on facebook. try Cafe Chocolate Almond Biscotti. I would also like to try their Balance Bar CarbWell. I liked Balance Bar on Facebook. Sweet and salty peanut butter! I learned that the company is located in Valhalla, New York.